Is a bountiful bonefish and permit fishery Slip Slidin’ Away? Skip May 14, 2018 Conservation, News, RECENT, Slide No Comments on Is a bountiful bonefish and permit fishery Slip Slidin’ Away? Biscayne Bay by Evan D’Alessandro – Rosenstiel School of Marine and Atmospheric Science. There isn’t a good reason to permit water pollution – not one. We license extraction companies to go right ahead, and God Bless America for agri farming operations dumping nutrient wastewater runoff into any water body they please – think Big Sugar in Florida. And coal companies, please, go right ahead, who needs trout streams and clean drinking water? Will declining water quality impact local Biscayne Bay businesses? A recent study conducted by scientists at the University of Miami suggests that degraded water quality conditions change how people use the bay, with significant implications for the local economy. Biscayne Bay, which shares its shoreline with the Miami urban area, supports a wide array of commercial and recreational fishing, watersports, and seafood wholesale businesses. Residents and visitors enjoy and depend upon its extensive mangrove shorelines, seagrass meadows, and coral reefs that serve as habitat for the bay’s fish. 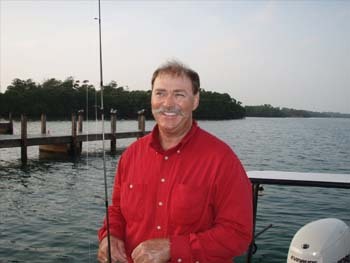 Known by the Miami Latino fly fishers as the Godfather of Biscayne Bay, veteran guide Capt. Bob Branham has fished it for 38 years. Click on image to visit Bob’s website. 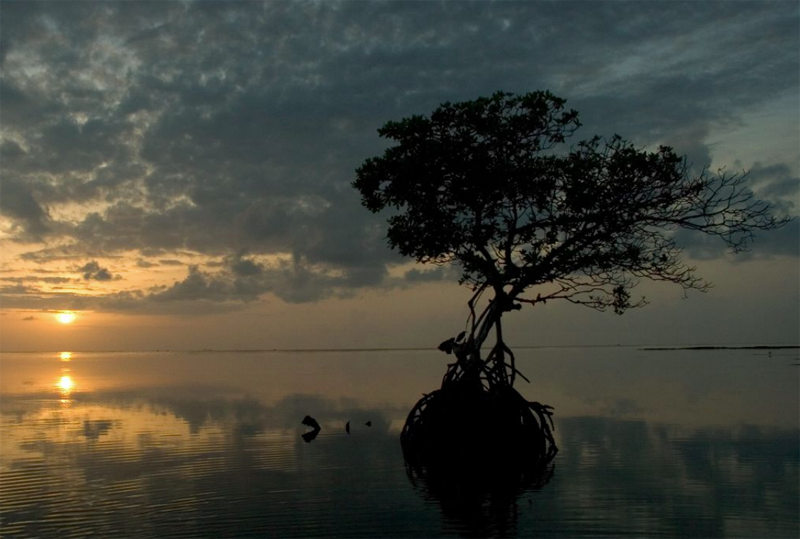 Concerns about declining water quality, and the threat it poses to both ecological and human communities led to Biscayne Bay’s designation as an NOAA Habitat Focus Area. Nutrient-rich runoff from the nearby metropolitan and agricultural areas flows into the Bay and has led to large algae blooms that are damaging to the health of the marine species that inhabit this unique ecosystem. These blooms may produce toxins that harm other marine organisms and humans, block the sunlight needed by seagrass meadows, and deplete oxygen in the water. Until now, the ways that these algae blooms affect the people who rely on the bay for livelihood and recreation have been poorly understood. One of the primary goals of the Habitat Focus Area team and its partners is to assess how the degraded health of the bay is impacting local businesses to ensure that they are adequately protected into the future. With NOAA funding, two scientists from the University of Miami set out to do just that. One main question these scientists worked to answer is whether fishing and recreation adapt to declining water quality by shifting to different, healthier parts of Biscayne Bay. The results of this study, which describe how those users perceive and respond to water quality challenges, will provide local policymakers and the public with information about the associated economic losses from degraded ecosystem health. Researchers asked businesses: what areas of the bay are most important to you? 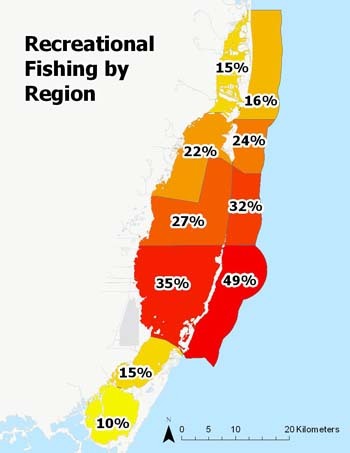 Recreational fishing in Biscayne Bay by percent respondents. Created by Samantha Dowdell with data from Florida Fish and Wildlife Conservation Commission. To determine popular locations used by different stakeholder groups, the researchers sent out online surveys and conducted in-person interviews to recreational and commercial fishermen, fishing guides, seafood wholesalers, and recreational watersports businesses (SCUBA, snorkel, kayak, and stand up paddle board companies). These surveys identified where activities are most concentrated and how industries would respond to declining water quality conditions. The answers allowed researchers to assess water quality impacts on these activities. The surveys and interviews indicated that each user group depends on different regions of Biscayne Bay. Recreational fishers, for example, more frequently visit the southern half of Biscayne National Park, especially those areas offshore of the southern barrier islands, while recreational watersports businesses heavily use areas off Miami Beach and in the Northern Bay. The seafood wholesalers who rely on products from Biscayne Bay reported that they obtain their fish from areas both within the Bay and along the reef tract outside of the bay. Commercial fishers in Biscayne Bay target four major groups of species: stone crab, spiny lobster, bait shrimp, and other bait species. Each of these is fished in different areas both inside and outside of Biscayne Bay. The shrimpers, in particular, noted that they previously fished in areas north of the Rickenbacker, but have shifted their activity further south as a result of deteriorated water quality in the northern area. All user groups agree that water quality in the bay is declining. However, adaptation to degraded water quality varies by industry group. Most recreational fishers, fishing guides, recreational watersports businesses, and seafood wholesalers said they would continue to operate but would move to alternative locations – most likely outside the bay. Commercial fishers, on the other hand, would likely stop fishing commercially if they were unable to rely on their current fishing grounds. Without a healthy Biscayne Bay, commercial fishers who rely on the bay for their livelihood will lose their jobs, in turn affecting the local economy.